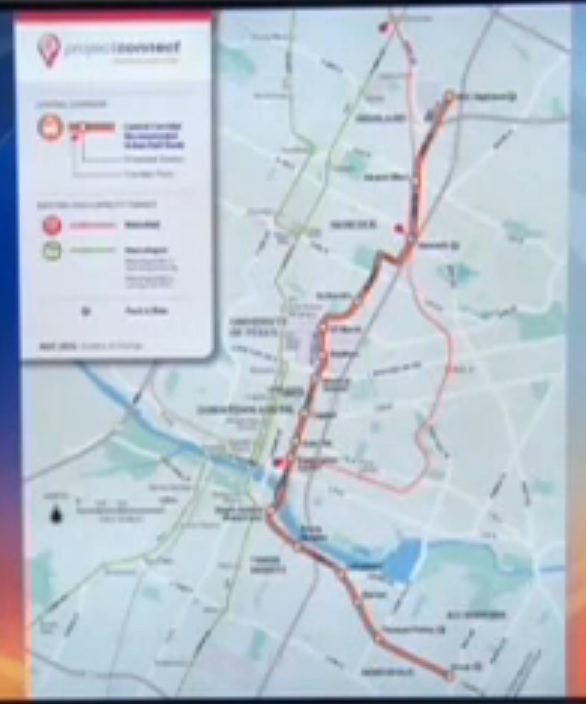 Left: Urban rail simulation (Graphic: COA rev. ARN). 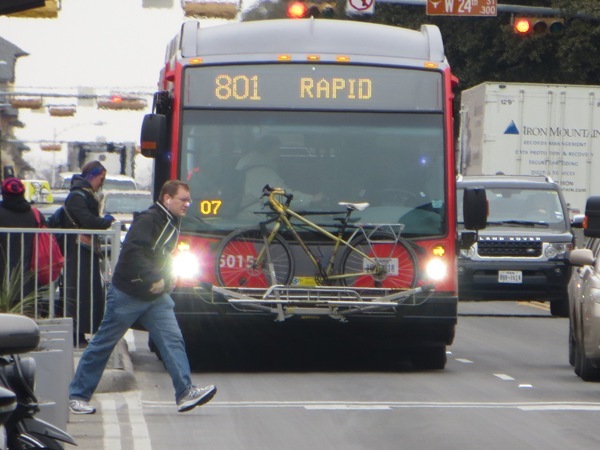 Right: MetroRapid bus on the Drag (Photo: L. Henry). 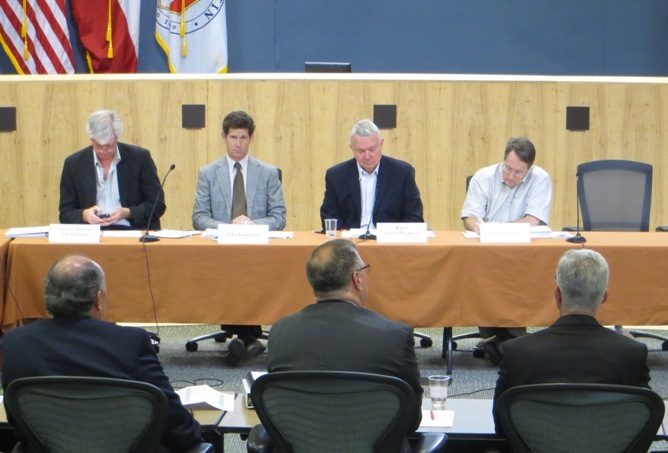 As this blog has noted, it’s curious how, in recent months, Project Connect — at least in official statements — has been somewhat distancing itself from explicitly advocating “urban rail” (Mayor Leffingwell’s recent “rail or fail” rhetoric is an exception, but, then, he’s not officially a Project Connect official) and increasingly portraying its focus to be “high-capacity transit“, a generic term that seems to apply to virtually all surface public transport modes approximately above the capacity of a van. Moreover, this “high-capacity” concept seems to consider just about everything somehow equal in function. Thus, bus routes and urban rail lines could, in this rather dubious schema, be interchanged or substituted in planning. 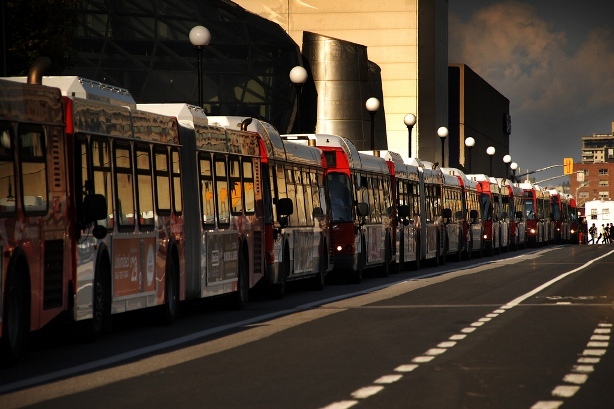 (1) It gives Project Connect and other public officials some flexibility to put urban rail where they want it, MetroRapid (faux “bus rapid transit” or BRT) where they want it … and it helps alibi why some areas supposedly due for “high-capacity transit” end up getting just a fancy bus route (MetroRapid). 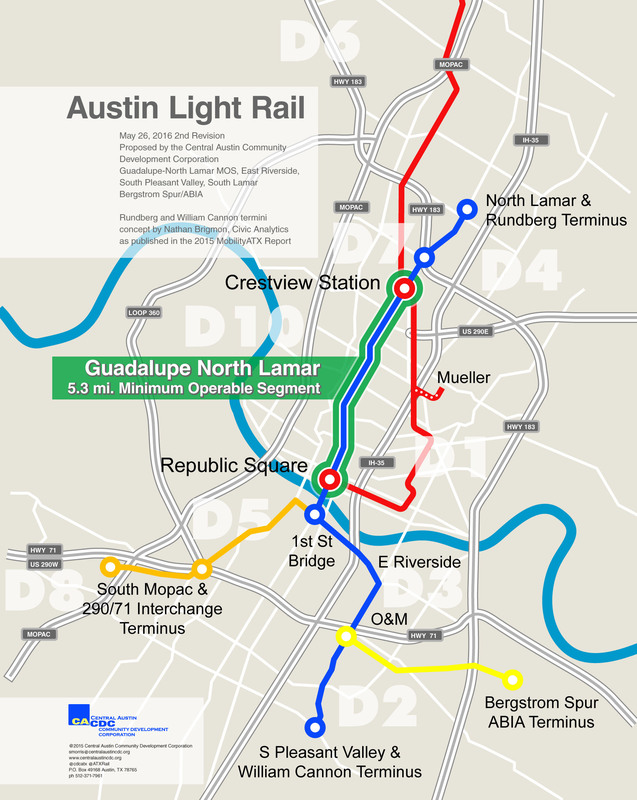 With money tight, Project Connect can install perhaps a few miles of rail (or perhaps none), cover the rest with bus service, and claim they’re offering a vast “rapid transit” system to the Austin-area public (and voters). 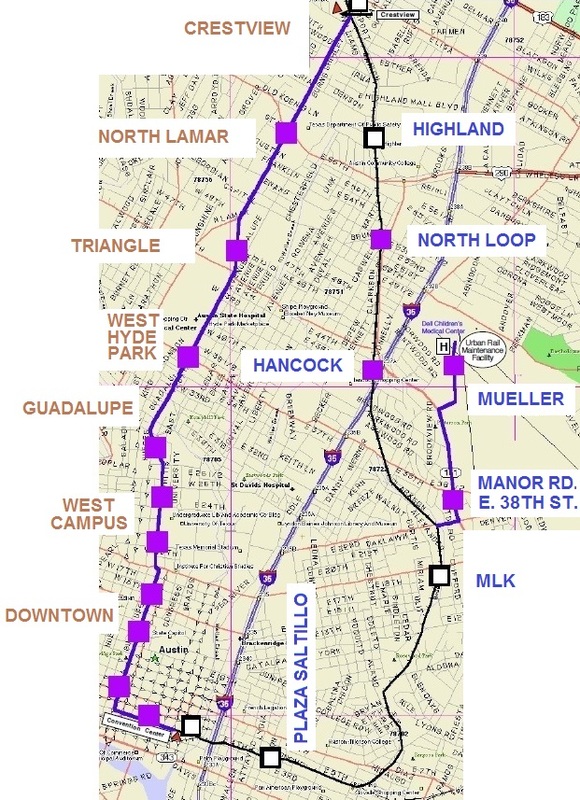 (2) It has allowed City and Capital Metro officials, as well as Project Connect’s leadership, to designate the modest, minimal MetroRapid bus service in the Guadalupe-Lamar corridor as “high-capacity transit” and even “rapid transit” — for which, it’s implied, this key section of the central city should be profoundly grateful. 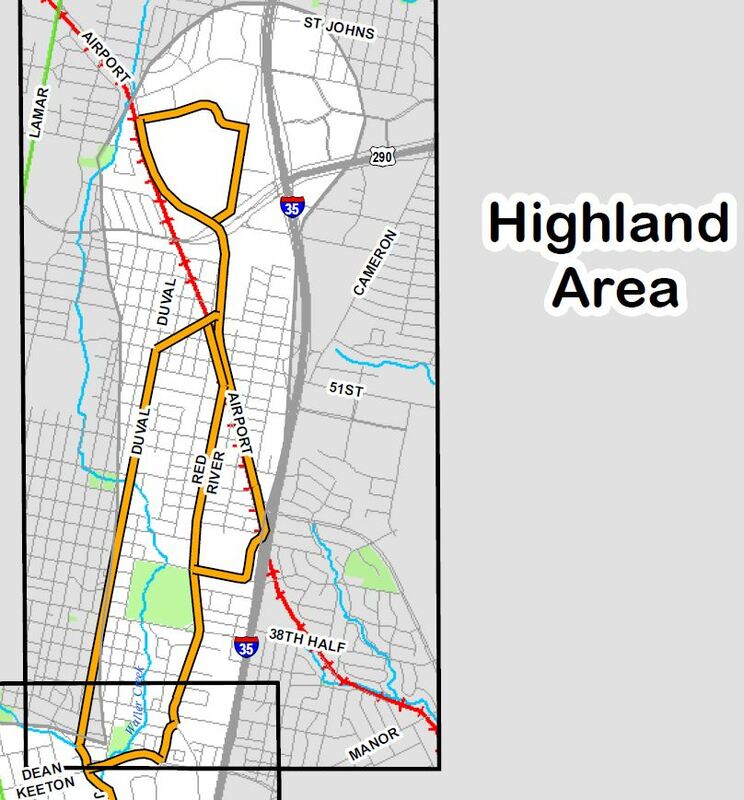 And in any case, it’s all the “high-capacity transit” these core neighborhoods can expect to get for the foreseeable future — so be content with what you’ve got, while we all move on. Of course, local officials and their planners insisted it had to run from downtown, through the relatively empty East Campus, to Mueller. 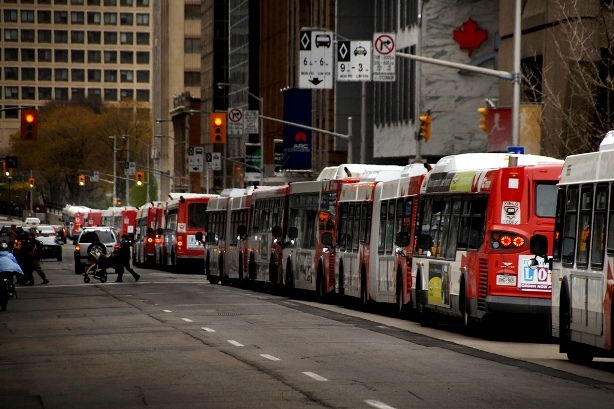 So … why not run just a good bus service? Well, official planners have gone to great lengths to justify the need for rail. 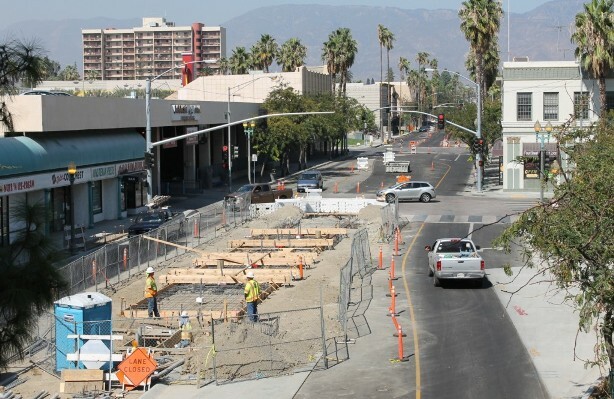 Rail, it’s argued, has an exceptional tendency to attract adjacent development, especially transit-oriented development. That’s true. Also true is their insistence that urban rail, particularly as ridership grows, is far more cost-effective than bus service over the longer term. 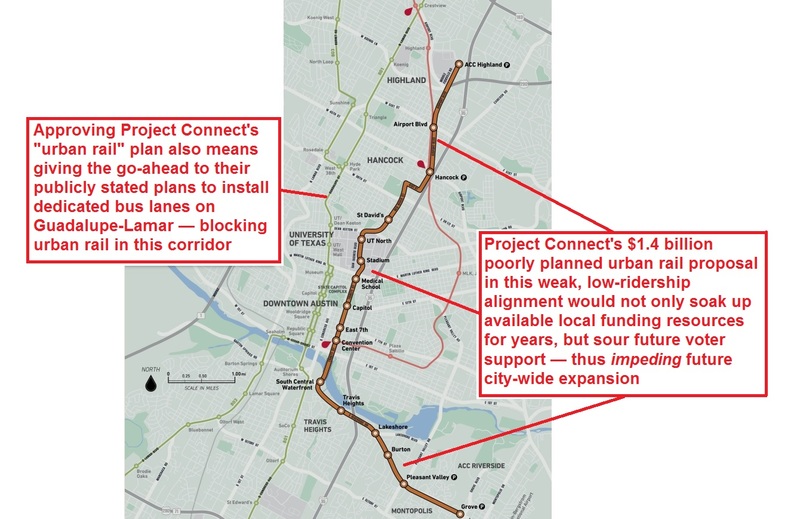 And that’s precisely the point succinctly made, for example, in a couple of neatly rendered data-visualization slides included in a presentation from Project Connect to the Transit Working Group (TWG) on 1 June 2012. This first slide compares urban rail and “bus rapid transit” (i.e., bus upgraded transit of some kind) in total cost per passenger. 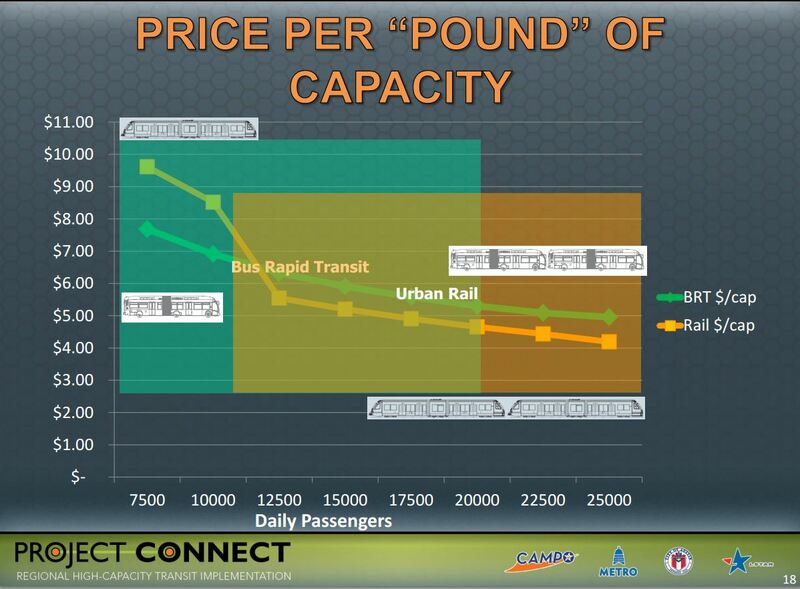 The graph indicates that rail and bus become equal in total cost per passenger (presumably, rider-trip) at a ridership level of around 10,000 daily passengers. After that, urban rail becomes significantly lower. 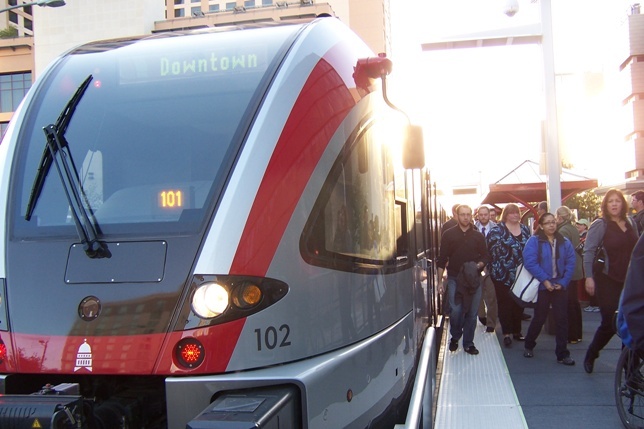 Total cost per passenger of urban rail becomes lower than “bus rapid transit” as ridership rises above about 10,000 per day. Graph: Project Connect. 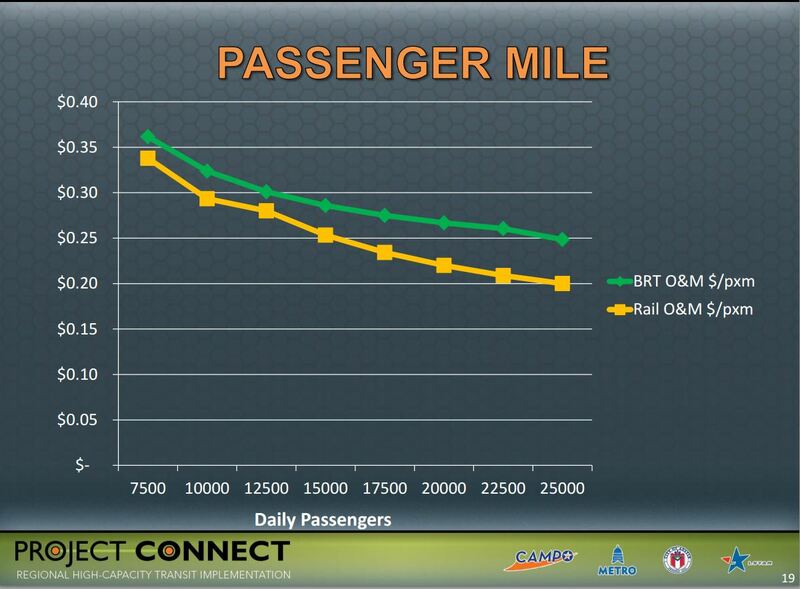 In this second slide (below), Project Connect displays that the operating and maintenance (O&M) cost of urban rail is projected to be consistently less than that of “BRT”. Operating & maintenance (O&M) cost per passenger-mile of urban rail is projected to be consistently lower than “bus rapid transit”. Graph: Project Connect. 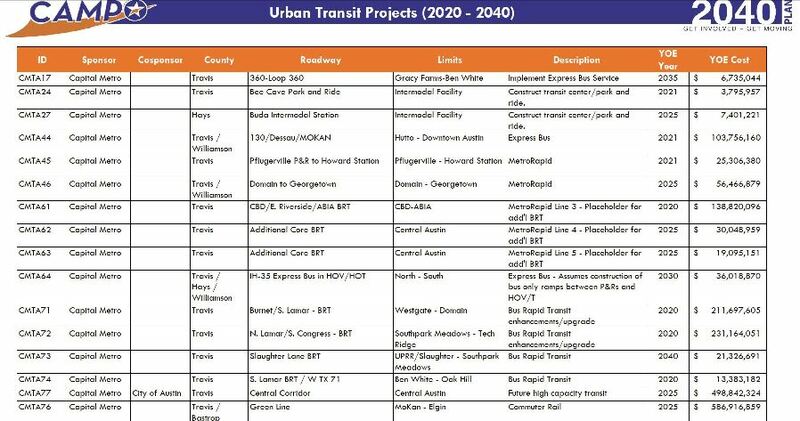 • If urban rail is so much more cost-effective than “BRT”, doesn’t this mean that it would be more cost-effective than MetroRapid, which various Project connect, City, and Capital Metro spokesmen have repeatedly characterized as “BRT”? 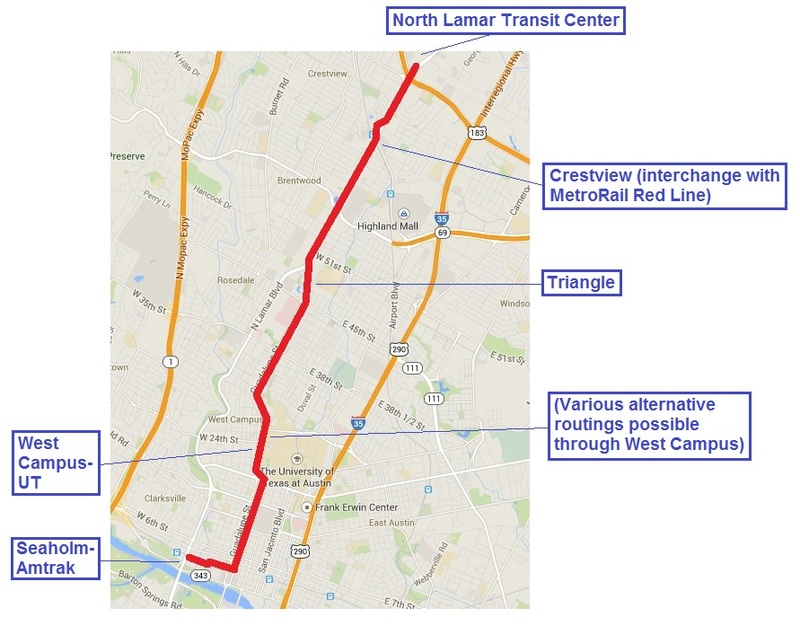 • If urban rail is indeed so much more cost-effective than MetroRapid, why is the Guadalupe-Lamar corridor being consigned MetroRapid as its “high-capacity transit” solution — especially when ridership projections have forecast this corridor as having the highest ridership potential in the entire region? 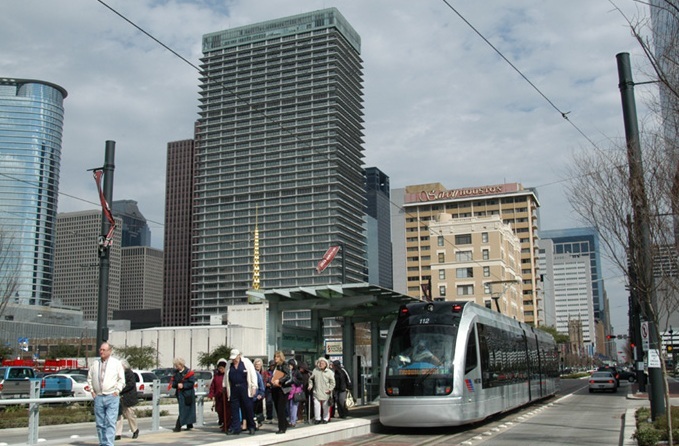 • Put another way — Why is Guadalupe-Lamar — Austin’s heaviest center-city local traffic corridor, and its densest and most promising core neighborhoods and commercial districts — being saddled with a more costly MetroRapid service, less appropriate for needed capacity, while the heavy resources to install urban rail are being focused on a convoluted Rube Goldberg-style route scheme to serve the East Campus, Hancock Center, and (purportedly) an eastern access to the Highland/ACC site?